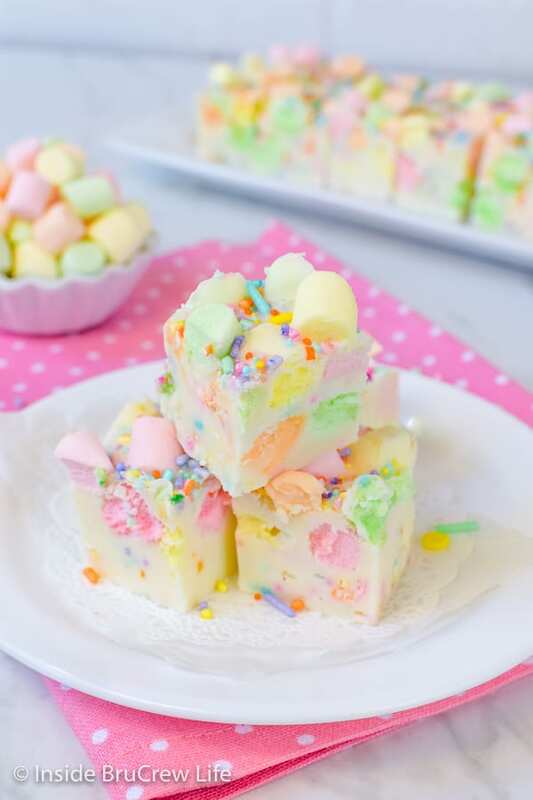 A plate of this pretty Easy Fruity Marshmallow Fudge is the perfect addition to your Easter dessert table. 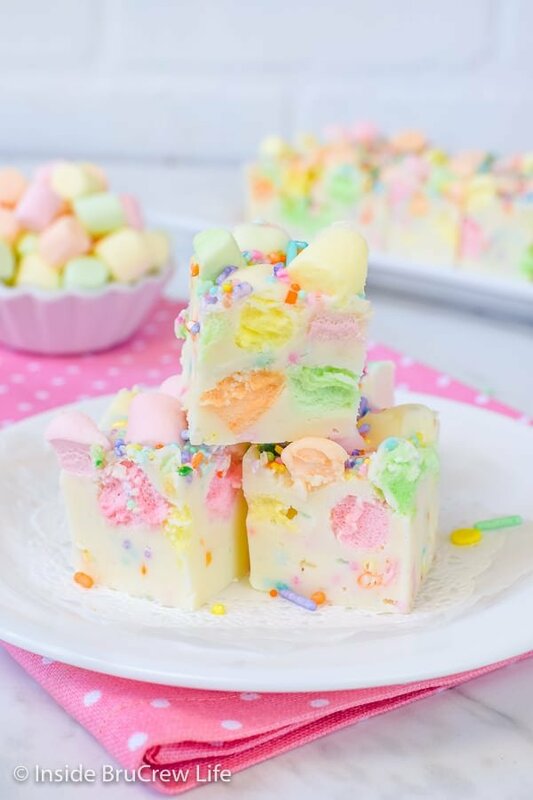 Sprinkles and colorful marshmallows add a fun texture and taste to this easy Easter fudge. A few weeks ago I had the awesome privilege to make a ton of desserts for a ladies event at our church. And I do mean a ton because there were over 100 ladies signed up for the meetings. So, that meant I had to bring my A game with lots of sweet goodies. Most of the desserts I made and shared were tried and true recipes from here on the blog because I just didn’t have time or energy to come up with lots of new desserts. The little mini version of these Strawberry Pretzel Salad Parfaits was a huge hit. And this Banana Nutella Snack Cake was another favorite that got so many compliments and requests for the recipe. 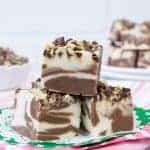 I did sneak in a few new fudge recipes because it’s a dessert that can be made in minutes, and it’s so easy to change up. Now I realize that most people make and eat fudge during the holiday months. I’m here to encourage you to get out of that dessert rut and make fudge all year long. Who’s with me? One of my favorite things to do when we go on vacation is to look for little fudge and candy shops and scoop out their flavors. Now usually most of those stores all carry and sell the same basic flavors. But I still have to check because you never know when you might find a new and exciting fudge flavor. 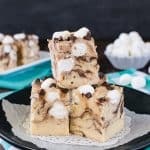 This Cappuccino Fudge and this Easy Turtle Cheesecake Fudge are ones that were inspired by fudge flavors I found at a few different craft fairs. Most of the time I like to make two ingredient fudge because it’s just so easy. You know the kind, right? Chocolate chips and a can of frosting. 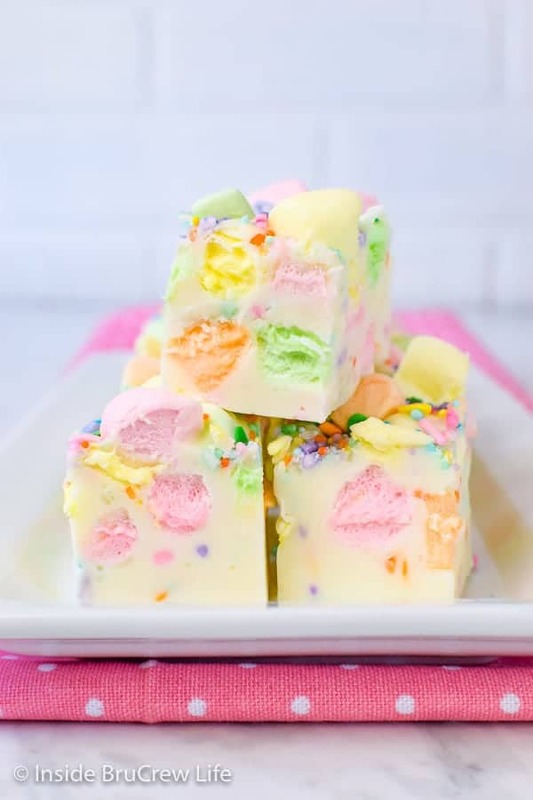 So when I needed another easy dessert to fill in at the ladies event, I made a batch of this white chocolate fudge jazzed up with some colorful marshmallows and pretty sprinkles. This easy no fail fudge works every single time. Although, I like to melt the chips with butter, so technically mine is three ingredient fudge. And I always add mix ins so it’s never truly two ingredient fudge. LOL! Line an 8×8 pan with foil or parchment paper. I like to use foil because it is easier to mold to the pan. If you use parchment, you can either use the foil backed parchment to keep in place, or use clothes pins or clips to keep the paper from slipping. Place the white chips and butter in a large pan over low to medium heat. Stir until it melts. Now this won’t be runny. The mixture will just be thick and creamy. Remove the foil lid from the frosting and heat it for 30 seconds in the microwave. 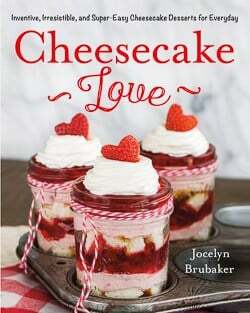 Pour the melted frosting into the pan and stir until everything is melted and creamy. Let the fudge cool for 10 minutes, stirring occasionally. 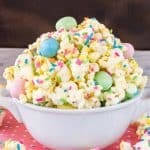 You want to let it cool slightly before stirring in your marshmallows and sprinkles because hot fudge will make those ingredients melt in a hurry. Add the marshmallows and sprinkles and stir quickly. Pour the mixture into the prepared pan and smooth the top. Sprinkle more marshmallows and sprinkles on top of the fudge for some color. Let it set completely before cutting it into squares. 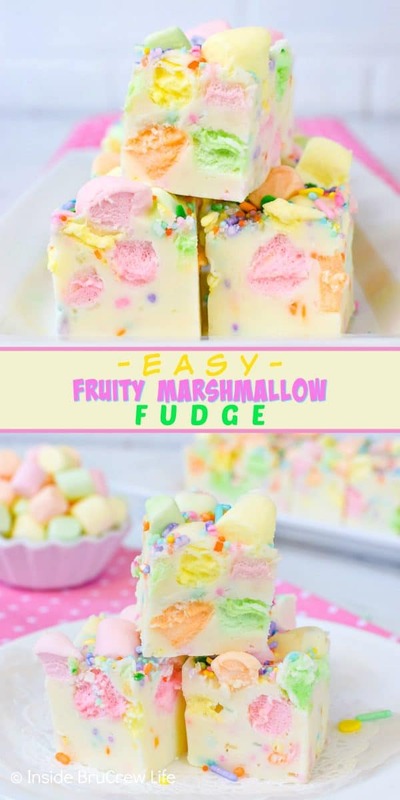 You can either cut this Easy Fruity Marshmallow Fudge into 36 or 49 squares. It just depends on how big or small you want the easy fudge to be. 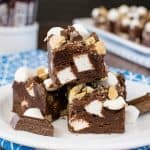 Three layers of cookies and fudge make this Neapolitan Fudge a knockout treat when it comes to dessert! Chocolate, vanilla, and strawberry is such a classic flavor. This No Fail Orange Creamsicle Fudge will add a pretty flair to your summer dessert tables. The pretty orange and vanilla swirls will have everyone grabbing another bite. 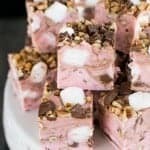 A pan of this easy Strawberry Rocky Road Fudge is loaded with marshmallows, pecans, and chocolate chunks. Pretty pink fudge with chocolate and nut goodness is a fun treat to make for parties. 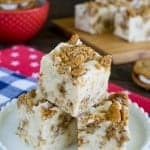 Easy 2 ingredient Coconut Pecan Fudge is such a great candy recipe! Also called German Chocolate Fudge, it disappears fast because everyone loves it so much! Pretzels and candy bars swirled in this easy Caramel Peanut Butter Pretzel Fudge add a fun crunch and chew to each creamy square. 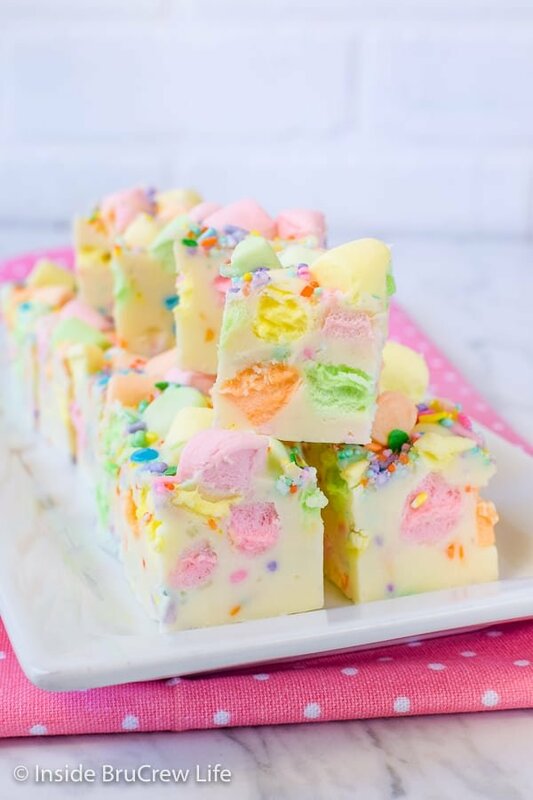 A plate of this pretty Fruity Marshmallow Fudge is the perfect addition to your dessert table. 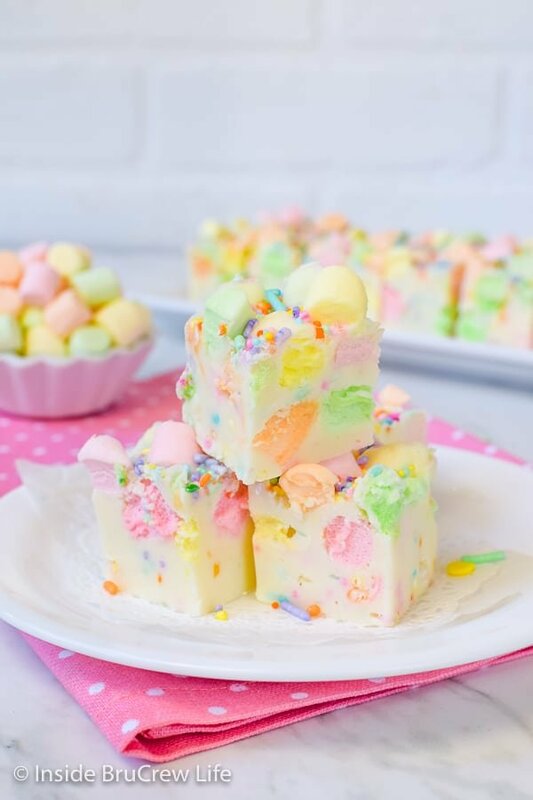 Sprinkles and colorful marshmallows add a fun texture and taste to this easy Easter fudge. Place the white chips and butter in a large pan over low to medium heat. Stir until melted and creamy. It will not be runny, just thick and creamy. Remove the foil lid from the frosting and microwave for 30 seconds. Pour the melted frosting into the pan. Stir the mixture until everything is melted and creamy. Let cool for 10 minutes, stirring occasionally. Stir in 1 1/2 cups marshmallows and half the sprinkles quickly. Pour the fudge into the prepared pan. Sprinkle the top of the fudge with the remaining 1/2 cup marshmallows and sprinkles. Let set completely before cutting into squares. These are perfect for Easter. Love the pastel colors. Just out of curiosity, what’s wrong with frosting?? 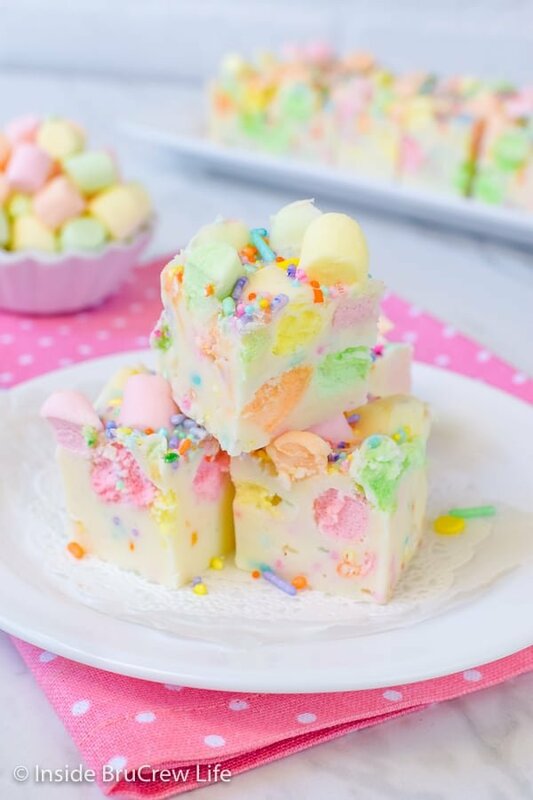 You could make this fudge using this recipe https://insidebrucrewlife.com/robin-egg-fudge/ Just leave out the malt powder and use marshmallows and sprinkles instead of the candies. Can’t get enough of this fudge! 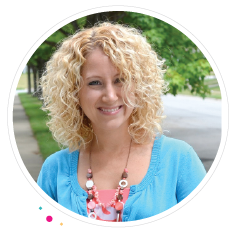 So perfect for Easter, baby showers, and birthday parties! This is so fun! Love the colors – perfect treat for Easter!